A Virginia family, Thomas and Elizabeth Meadows lived along Naked Creek on the Page and Rockingham county line. In the family, there were four sons [Mitchell (born ca. 1823), James (born ca. July 1826), William T. (born December 7, 1839), and Henry “Hiram” (born September 1842)] who would be considered age-eligible for military service by the time of the Civil War, and, naturally, being from Virginia, the assumption might be fairly automatic that there service would be with the Confederacy. Incidentally, a fifth son, Emanuel (born February 21, 1833) left Virginia for Harrisburg, Pennsylvania in the late 1850s. Out of the four brothers who remained in Virginia, Confederate service records can be found for James, William and Henry. Actually, James’ service was not recorded in the military records but in pension records stating that he served in Company #4, of the Nineteenth Virginia Heavy Artillery. Since he has no service record, it can be safely assumed that he entered the unit late in the war (finding late war Confederate enlistment records can be an impossible task). William T. is shown in the records of the Tenth Virginia Infantry as having been conscripted on July 1, 1863 at Harrisonburg into the ranks of Company I. His service was short-lived, and by July 23, 1863, he was listed as absent without leave. The third brother to serve in the Confederate army was Henry (also known as “Hiram”), who was shown as having enlisted in Company L, Ninety-seventh Virginia Militia on August 8, 1861. So, on the surface, excepting the service of William T. Meadows, it appears that the family was pretty much behind the actions of Virginia in support of the Confederacy. Care should be made however, as information found by “scratching the surface” with the military records can be deceiving. The first obvious problem in making an assumption about the family’s overall support for the Confederacy is easily identified in William T. Meadows – a conscript who took the first opportunity to break away from the conscript hunters and become a deserter. But, the actions of one brother do not necessarily define the sentiments of the others. As in all cases of finding a deserter in the family, you must look beyond the one brother (or family member) and see what may have motivated (or not motivated) the other brothers in their service as Confederate soldiers. In fact, James Meadows’ service as a Confederate soldier offers complications in defining the sentiments of this family. As a late war entry, was he actually a conscript and, unlike his brother William, was he not afforded the same chance to desert? Or, was James actually a true late war enlistee who remained faithfully in the ranks as a Confederate soldier? As I mentioned, the only record of service for James exists in a pension record, and basing “loyal service” on a pension record can be taking a great deal for granted. Confederate pension boards in Virginia were, for the most part, made up of local Confederate veterans, at least early-on in the process. However, by the 1920s, early 1930s and onward, Confederate veterans were not manning the boards as many had died or were “up in age.” In the early part of the pension application process, the veterans appear to have effectively screened pension applications, at least most of the time. For the most part, it might be understood that veterans were able to look at an application, recall the applicant’s sentiments and actions at the time of the war, and make an accurate determination as to whether the applicant was a “loyal” Confederate and if he merited a pension. Once again however, the veterans on the pension board could not accurately speak for everyone as some of the late war enlistees were enrolled or conscripted into less familiar companies. For example, the most commonly recognized companies formed in Page County (namely, Company K of the Tenth Virginia Infantry, Company H of the Thirty-Third Virginia Infantry, Company D of the Seventh Virginia Cavalry, Company E of the Thirty-fifth Battalion Virginia Cavalry, and the Dixie Artillery) had some sort of representation on the pension board. If a veteran or veterans serving on the pension board was/were not familiar with an applicant and his service, they could turn to the local camp of Confederate Veterans (of which, the veterans serving as board members were usually members), and hopefully, somebody in the camp could vouch for the applicant or argue against the applicant’s claim of loyal service. But, before digressing too much from the central focus of this article on the Meadows brothers – if brothers William T. and James leave us wondering still where the family stood on support or opposition to the Confederacy, the next best thing in the assessment would be to figure out where the other two brothers stood (not to say however, that, in all cases, all siblings shared the same sentiments). Mitchell Meadows offers one of the most important pieces of information in the assessment of the sentiments of the Meadows brothers. One set of family stories reveal that Mitchell was “shot and killed during the Civil War.” On the surface one might assume that being shot and killed, Mitchell must have been a soldier. A search of military records does not reveal military service, however, and, considering the efforts of William to remain out of the service, it seems more plausible that Mitchell may have been killed in the act of evading Confederate conscript hunters. A second story, related to me after my first effort of looking into Mitchell’s story, revealed what I had suspected. Mitchell was taken, at gunpoint, from his home by Confederate conscript hunters. With his hands tied and forced to walk behind a horse on a lanyard, Mitchell was, somehow, able to break away and made a run for it. As the story goes, either when in the act of escaping or after he had made his way back to his house, the conscript men caught up with Mitchell and killed him. Mitchell’s story, when combined with the story of Henry Meadows gives us an even better glimpse into what may have been the overall sentiments in the Meadows family. Having “enlisted” on August 8, 1861 in Company L, Ninety-seventh Virginia Militia, Henry “Hiram” Meadows may have been reluctant to serve from the onset. First of all, as a regiment that had existed prior to the war, when the Ninety-seventh Virginia Militia was called into the service of the Confederacy in the summer of 1861, it was not, as some may believe, enrolled with ranks teaming with patriotically motivated volunteers. Rather, the men of the Ninety-seventh who were enrolled were draftees. Of course, that is not to say that all men in the Ninety-seventh were not in favor of the Confederate cause. In the case of Henry Meadows, he enlisted, but following the First Battle of Manassas, took the opportunity, along with brother William T. Meadows (who had been enlisted on July 22, 1861), to go AWOL on November 4, 1861. They were still absent when the last complete muster roll was filled out for the Ninety-seventh on December 31, 1861. While William held out unsuccessfully against Confederate conscript hunters in Page and Rockingham Counties, Henry opted to leave the militia and head for Pennsylvania, where his fifth brother had moved prior to the war. Though it is unclear exactly when he became a temporary resident of Pennsylvania, by 19 September 1863, he was drafted into the Union army and made a member of Company E, 143rd Pennsylvania Infantry. Even entering into service, as a draftee in late 1863, “Hiram” Meadows saw extensive service. After leaving Pennsylvania, he was likely one of the 360 recruits who arrived with the new group of regimental recruits in September and October, 1863. Though a notation in his file (“A deserter from Rebel service, not to be assigned to field duty”) made reference to his not being placed in a combat role, it appears that he was eventually placed on the firing line along with the rest of the regiment. Within a month of his reporting to the 143rd, he would have been involved in a sharp skirmish with Confederate forces at Haymarket. From November 22 to December 5, the regiment performed railroad guard duty at Manassas, marched to Paoli Mills and finally, after eight months constant campaigning, went into winter quarters at Culpeper on December 27. One can only imagine how odd it must have felt for Meadows being so close to home, but in the occupying army. Before moving in the spring campaign of 1864, the 143d was assigned to the First Brigade, First Division, Fifth Corps. Once the campaign season opened, the regiment suffered severely at the Wilderness and at Laurel Hill. However, it was in action on the North Anna River where Henry Meadows was wounded in the calf of the right leg on May 23, 1864. Sent first to a Fifth Corps field hospital and then to Emory General Hospital in Washington, D.C., Meadows was later transferred to Newton University General Hospital in Baltimore and eventually McClellan General Hospital in Philadelphia by October. He remained at McClellan Hospital until mustered-out on May 16, 1865 (though the war was already over, the regiment did not actually muster out until August 1865). After receiving an honorable discharge, Henry Meadows returned to Page County, and on September 7, 1867, married Ardista Breeden (who was born January 1851, a daughter of Wesley Whitfield Breeden and Elizabeth M. Eppard). The couple had more than 10 children – interestingly, the first and last child were seemingly named out of influence from Henry’s service in the Union army – the first was named Columbia Esteline (born about 1869) and the last child was named Ulysses Edgar “Bud” Meadows (born December 24, 1896) – apparently in honor of Ulysses S. Grant. Other children included Crimora, Armetis (born September 19, 1870), Eliza H. (born about 1871), Dolly Francis (born March 19, 1874), William D. (born about 1875), Henry Dorsey (born March 15, 1875), Newman Thomas (born September 12, 1876), Ardista D. (born October 7, 1878), Wesley Monroe Cameron (born June 20, 1881), Emma “Annie” C. (born February 24, 1885), Josephine F. (born June 1890), and Virginia C. (born October 21, 1892). In October 1889, Henry Meadows applied for (application #732108; certificate #525060) and was awarded (on June 27, 1890) a pension of $6.00 per month for disabilities caused by his wound and an injury to his eye (while in action on May 23, 1864, a ball splintered a limb of a tree and the splinters entered his eye). He was dropped from the pension rolls on March 14, 1895, on the grounds that he was not ratably disabled under the act of 1890. He filed again on July 17, 1890, but was rejected on May 27, 1902 because the government noted that he had “rendered voluntary service in the Confederate army.” Apparently it took some time to clear his record of “voluntary Confederate service” and by 1912 he was once again receiving a pension. By 1918, Henry Meadows was receiving $38 per month for his pension. Henry Meadows died on December 10, 1919 and was buried somewhere near his home in Jollett Hollow. Story courtesy of Robert Moore. Used here with permission. Photo of Henry and Ardista courtesy of Mr. Larry Lamb. **Correction: I believe that, the way in which this is written, does suggest that James Meadows may have applied for a pension in the 1920s or 30s. James Meadows applied for a Confederate pension in 1904 (age 77, living in Jollett Hollow). Certainly, at the time of his application, there were fellow veterans alive who could attest to his faithfulness to duty as a soldier in the Confederate army. Regretfully, I do not recall who signed as a comrade (it’s been nearly 20 years since I last went through every single Confederate pension application from Page County), but the signature of a comrade from the same unit attesting to his service would be an indication that he did serve faithfully. Specifically, I’m saying this means that he served faithfully, but that does not clarify that nature of his becoming part of the Confederate army or his sentiments in regard to the Confederacy. By nature of being part of a unit that was formed neither in Page or Rockingham County, it does indicate that he was conscripted, perhaps forcibly, from his home (which, in 1860, was in Waverlie). This seems supported by the stories about James’ siblings. Most men evaded forcible conscription by beating the conscription hunters to the punch, so to speak. Specifically, if a man joined prior to conscript hunters coming to the residence and taking a man away, he could at least pick the unit in which he served. This usually meant enlisting in a unit in which he knew other family, neighbors, and friends to be serving. This entry was posted on October 29, 2008 at 12:09 pm and is filed under brutality in conscription, Examples of acts against Southern Unionists, murdering Southern Unionists, Virginia Unionists with tags Confederate conscription, Henry "Hiram" Meadows, Meadows Family, Mitchell Meadows, Page County, Rockingham County, Union draft. You can follow any responses to this entry through the RSS 2.0 feed. You can leave a response, or trackback from your own site. If I were the author I would not question James Meadows legally sworn statement of his Confederate Service. Honor and a man’s word meant more then than it does today. James was not eligible for conscription until the Confederate Congress Raised the age limits to accept men 36-46 years of age. James was 37 in 1863. He was sent to Camp Lee then to the 19th Virginia Battalion of Heavy Artillery. Being an “old man” I would make the assumption he was not fit for active field service with the Army of Northern Virginia. The 19th was station at Fort Harrison, Richmond defenses and detailed men to guard POW “camp” in Richmond. James states he fought in the battles at Fort Harrison. I also believe the author takes liberty in infering why Henry Meadows named two of his children. He miss spells Ulyssus (Bud) name with an e. 143 Pa. Infantry was formed in late 1862 and went into service Feb. 1863. If he was drafted in late 1863 I find it hard to believe he served with the 143 Pa., as the Union army created new regiment and did not refill the ranks of old regiments as the Confederate army did. I find no where in the family history book of where he is refered to as Hiram. Is this the same man? Many men did not want to serve in either army during the war. Using the reasoning of the author every man the deserted the Union army was a Northern Confederate. My opinion is the author is distorting facts and adding some fiction to suit his purpose. While I thank you for your comment, I don’t think you read this piece carefully or with an objective eye. First, James Meadows entitlement to a pension was not questioned here. The circumstances surrounding his service (how he came to be in the service… specifically, involuntarily) is part of the focus. “Honor” had nothing to do with my comments about James and his service. James became eligible for conscription in 1863, as you point out, but that doesn’t mean that he went willingly, and the circumstances surrounding how he went into the service are in question because of stories surrounding his siblings (William and Henry). On top of this, there is the story about Mitchell, that lends even more weight to a greater level of reluctance in the family. As for Henry Meadows, there is no mistake. Henry “Hiram” Meadows WAS in the 143rd Pa. Inf. and returned to Page County after the war and, as his pension records CLEARLY reveal, his address in was southern Page County. Regarding the spelling of the children’s names, anyone who knows the literacy of mid-19th century “hollow folk” (some of my own family being among them… and even some of my ancestors who were living in the flatter lands of the Valley could sign with nothing more than an “X”), knows that “precision spelling” is not a sure thing. That’s simply something that should be understood as a possibility. I agree wholeheartedly about one thing that you say… that many men did not want to serve in either army during the war. I have no doubt of this. However, the pressure applied by Confederate conscription hunters sometimes forced otherwise “leave alone” men into situations where they became angry enough to join the Union army just for a chance to get back at the conscript hunters (at least one of my own relatives, Christian Nicholson, was “somewhat” among this group). I don’t see this as the case for Henry “Hiram”, however. I took no liberties in assessing the situation of the Meadows family, and made the assessment based on what evidence is available. We should make assessments in this manner, vice piling on assumptions based on how things “seem” that they should be understood because of a very distanced “memory” of the past. Sir, You insinuate that James applied for a pension in the 1920’s &1930’s. James applied in 1904. You also insinuate he may not be loyal because the UCV camp had to rely on witnesses. So it does appear you are questioning his and his witnesses honor. Because James may have been conscripted does not make him disloyal to the Commonwealth of Virginia. Many families had men serve on both sides. You do not and can not know why William choose to AWOL. Again the author distorting or omitting facts to serve his purpose. Despite your accusations, I made my point without intent of serving, as you suggest, an agenda. If I were serving some agenda, I would have never allowed your comment in the first place. I can appreciate your defensive posture, but I’m more interested in exchanging comments that are made in the interest of understanding the nature of James’ service. Nonetheless, my focus here is on the family, not just on James. My approach to this is in no way a blight on the family name. I can greatly appreciate the complexity of their situation and an effort to understand that situation should be understood. In fact, I rather admire the people involved in this situation. I do have to wonder why you do not concede on other points, most especially regarding the facts surrounding James’ brothers. I cannot help but think that you might be too close to the matter to look at my article with an open mind, as a direct descendant, perhaps, of James. I will acknowledge that it might sound as if I were suggesting that he applied for a pension in the 1920s or 30s. I know, by my hand-transcribed records that are sitting in front of me, that he applied, as you state, in 1904. Please note additional commentary added by me in the original post (indicated by “**”). As I stated in the article, the actions of one brother do not define the actions of the others, but there does seem to be a trend with James’ sibling that would suggest that James did not want to serve and was conscripted forcibly. As I said above, see “**” for more details about conscription and how men came to serve in units that were not formed in their home counties. While this may be the case and supporting the Confederacy may not have been his sentiments, the actual service of James may have been faithful and unbroken. This is something that will, in all likelihood, remain a mystery (that’s simply the nature of the game when it comes to the poor quality of late war Confederate service records and in the absence of any other information that would state clearly otherwise). As for pension applications in later years, I’ve been through enough of them to know that some of the pensioners had no interest in rehashing the war or, in some cases, remembering it, other than to get a pension offered them for the hardships that they experienced, and that’s the important thing. Whether they wanted to be there or not, there is little doubt that they faced hardships that we can only begin to understand today. Without a doubt, the pensions were “earned” for the hardships that these men and their families endured, but let’s be clear… the pensions were not a reflection of some sort of unquestionable support for the Confederacy. Pensions were offered to men who left a record of faithful service, but that does not mean that they really went to war “for the Cause.” More importantly, only those within a lower income bracket could qualify for the pension (I will add that most of my direct ancestors who served in the Confederate army were also among that group), and they gladly made application to receive a pension in order to supplement their income. Whether I wanted to be there or not, if I were in a similar situation, I’d apply for a pension also. So, all of this said, if you want to come at this with an open mind, then I’ll be happy to engage you further, but if you continue on this course, I’m sorry to say that this exchange is at an end. Would love to see a picture of Henry & Ardista, he was my great great grandfather too. My line would be Henry, Wesley,Clarence, Richard and then me. Hi Larry I was just wondering if you have access to my email address?? Or do you need it? Interesting story, though slightly different from the one I’ve heard all my life. My mother is 91 years old, a daughter of Shenandoah (which, I suppose, makes her a granddaughter of the stars). Her grandmother was Mary Meadows, who was born in 1964, the daughter of Mitchell Meadows and Verenda McDaniel. My grandmother used to tell my mom the story of how her grandfather was shot by Union soldiers while coming home on leave to see his new baby daughter. I have no reason to believe either your or my grandmother’s story, though I would prefer my family’s, since if that one isn’t true, it probably means they were shamed into a more honorable fib. Can you tell me your source(s) for the Meadows story? I’d like to know their reliability. Thanks…..and thanks for diligently posting such interesting data/stories as you do. I’ll have to look back in my sources, but know they were on the level. If you check out the names of Henry Meadows’ children… they echo a sentiment in a different direction. After reading your story I quizzed my mom for further information. She doesn’t remember anything, but when I asked if her family leaned Confederate, she said, “Well, they named Bobby [her younger brother] Robert Lee Merica [her maiden name]. Cynthia, we are related, My great, great grandfather was Mitchell >Thomas Wesley> William Dorsey. never heard the story. Your Grandmother’s Grandmother, Mary was Thomas Wesley’s sister. How about that. Have any more info? Have you been to the Cemetery in Jollett Hollow on top of the hill? The Mitchell Meadows story continues to intrigue me. I got another tidbit of information from my mother recently. She is Mitchell’s great-granddaughter, and growing up, she frequently visited with her grandmother, Mary Meadows Collier, Mitchell’s daughter. I’ve already related to you the story that comes down our line, that Mitchell was on his way home to see his new baby daughter (my g-g-gmother) when he was taken as a spy and killed. The new puzzle piece my mother related is that his killers “dragged the road with him,” and dumped him at the front door of his home. Research is an important part of my work as a non-fiction writer. I’m a stickler for facts, and don’t believe or use a story until it can be verified by the facts. While the circumstantial facts you present are compelling, they are not conclusive. Your choice to believe the story of “two Meadows’ descendants (both still retain the surname)” rather than the one I provided seems to be predicated on theirs fitting neatly with your presumptions, not because their story is more believable. My version, while not coming from a person who “still retains the surname,” does come from one who heard the story straight from the mouth of Mitchell’s daughter. That she does not bear the surname has not an ounce of relevance. Indeed, you do not say how far removed from Mitchell your two descendants are, and logic would say that the further from the source, the more a story is likely to change in subtle ways. Robert, I am not invested in “my version,” and yes, yours is more plausible, based on your well-researched but still one-step-removed evidence. I do, though, take issue with you presenting your story as fact, when in fact there is no confirming evidence. You have clearly put heart and soul into researching, analyzing, and presenting our ancestors’ lives, and I’m very grateful you bring their stories to life for all to enjoy. You are a historian, and as such, should make clear that in certain instances your conclusions are theory, not fact. This leaves room for you and others to fill in the missing facts as they are found. That is what continues to stoke my interest – the possibility that the mystery will be solved one day. Thanks again for sharing what you find. Thanks for returning to comment again, and adding another element to the story. While the circumstantial facts you present are compelling, they are not conclusive. Your choice to believe the story of “two Meadows’ descendants (both still retain the surname)” rather than the one I provided seems to be predicated on theirs fitting neatly with your presumptions, not because their story is more believable. The oral stories I heard came from those who still carry the Meadows surname. That statement wasn’t made to add weight to what I say. I simply made the statement to better define my source. I wish (very much) I knew the names, specifically, but I do not recall. I’m afraid you have taken more from it by suggesting that because I said this, in this manner, I have tried to discredit your statement. I’m sorry you feel that way, as this was not my intent. You are a historian, and as such, should make clear that in certain instances your conclusions are theory, not fact. This leaves room for you and others to fill in the missing facts as they are found. Consider this… how many historians that you know start off by saying, “the following may or may not be true, and is based purely on how I have assembled the various pieces of evidence”? We take the pieces that we have and put them together. The various documents and oral history are woven together based on patterns that we, as historians, see, and the “glue” is a testament of how invested the particular historian is, in his/her particular area of study. Also, the difference that exists in my document (a former print article, turned into a digital document that you see here), is not so static or “conclusive”, because it is now a digital document. By virtue of the fact that you are contributing to the document shows that it is not a static piece of history and it is not, therefore, “conclusive”. It is another form of “living history”, if you will, because just how far the comments will take the original piece remains to be seen. Are you also aware of the wartime articles about the Meadows and Lamb families as refugees? There’s some information that I haven’t added to this yet. Extract from an editorial in the Harrisonburg Rockingham Register, January 4, 1861. The Shenandoah Valley had a large population of people of German ancestry, who may have owned fewer slaves on average than other residents, leading some people to suppose that those Germans might not share with other white Virginians a determination to oppose Republicans and other antislavery advocates. “No people are truer to their fatherland,” the editor of the Harrisonburg Rockingham Register, wrote at the beginning of January 1861, and “no people are more ready and willing to ‘fight’ for the protection of their honors and their firesides than the good people who make up the mass of our population.” In the presidential election in November 1860, voters in Rockingham County gave Democrat Stephen A. Douglas 46.48 percent of the vote, the highest percentage in Virginia. One month after the editor published his comments on the inhabitants of the county, the voters elected three men who were all firm opponents of secession to represent the county in the state convention. Hi Cynthia, Yes, I’m very familiar with the mindset of Virginia in early 1861. The best example of how the Valley was actually split can be found in neighboring Augusta County, in the two Staunton newspapers. One was clearly secessionist in spirit, while the other was Unionist. Even so, Unionism is not easily defined, as many who were Unionists in Jan. 1861, proved to be conditional in sentiment. I am enjoying reading your blogs as having grown up in Jollett Hollow and graduating from Page Co. H.S., I share ancestors with others here having the last names of Nicholson, Meadows, Lam, McDaniel, Tanner, Hensley, etc. I especially enjoyed viewing the picture of Ardista Breeden Meadows who was my gr-gr aunt. Thanks, Lois! Glad you are enjoying them. What’s your connection to the Nicholson line? I am a descendant of Alexander and Sarah Breeding/Breeden Nicholson of Madison Co., Va. He was a son of Michael and Eleanor Sandy Nicholson and a grandson of John and Ann Wiggins Nicholson. By the way, I appreciate the fact that your ancestor, Caleb Smoot, was a witness to marriage consent of my ancestor Susannah Tanner to William Breeding/Breeden in Madison Co. (Bondsman was Alexander Smoot.) Caleb Smoot, Alexander Smoot, and Susannah Tanner were all orginally from St. Mary’s Co., Md. According to death record in Page Co, Va., she was the daughter of John and Elizabeth Tanner. In addition, my ancestor Nancy Ann Tanner married James Breeding/Breeden in Madison Co., Va. Bondsman for their marriage was James Smoot. It appears that Eleanor Veale Smoot of Md. was the grandmother of Caleb, Alexander, and James who had to be related to my Tanner ancestors but I cannot find the documentation. Nice article, but having sources listed might have helped confirm things. Thomas and Elizabeth are my ancestors (3rd great grandparents) and I have read and researched for years on the Meadows, Breedens and Tanners. Still all in all very nice article. 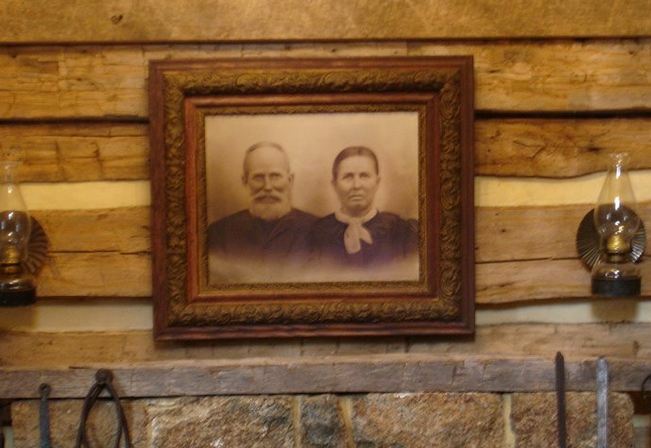 To Lois Watson, Susannah and William were my “4” great grandparents also. Indeed they might, but having been burned in the past with plagiarists (too easy to extract material from the Web and use it for their own) in my web pages created in the mid 1990s, I prefer to remain inconsistent with sourcing. Hello again Mr. Moore, I re-read your article again (and I have to admit quite a few time). I wanted to say Thank you for at least giving me a peak into my ancestors. Having Thomas and Elizabeth has 3rd generation grandparents in a family tree has been till now just names on paper. After reading your article my family is more real. I also have found out the hard way how information has been used (and twisted) in family genealogy. I wanted to use this source for Thomas and Elizabeth and their children and can I ask how is the best way to give you credit for this. Thank you again for helping this family come alive. Glad you have enjoyed the post so much. The story of the Meadows family was a great find and I enjoyed trying to unravel the mysteries behind it. You can cite this blog post using the following recommendations… found here. I very much agree with you Mr. Moore. In my family research I have found so many different versions of a story or a name. Even down to the Census records, I am not even sure I can trust a lot of what is listed (based on a he is listed as a she or birth place is all the same state on a census). I am enjoying reading your historical writings and I can honestly say I am learning more about my ancestors life in Page County and Rockingham than I have the length of time (20 years now) that I have researched my family of Breedens, Meadows and Tanners. Thank you for opening a different perspective on their life then just a list of names, numbers and dates. I look forward to reading more of your blog. How would I find info on my great,great grandfather Emanuel Gray who served with Co H 33 Inf were do I look,thank you.